What is the greatest tool Chess at Three uses to teach chess? The obvious answer is a chess board and pieces, but I’d like to dive deeper and say that it is our use of Thinking Cups. In every lesson we teach, from the first to the last, our tutors use Thinking Cups. To make a Thinking Cup, children clap their hands together, then open them up (keeping the bottoms of the palms together) to make a cup, and then put their chin in the cup. It’s not only a very natural stance for anyone to rest and focus, but also a very fun activity. We make this stance important so that we can use the tool to its greatest potential: self regulation. Simply put, self regulation is all about control. Getting a child to control themselves is what every educator and parent seeks to do. Now, don’t worry – we at Chess at Three are not trying to create soldiers who are super stiff and held down under the restraints of control. We want children to learn control so they can relish in the moments when they are “out of control”, or unfettered to explore and create. Not only have I tutored hundreds of children through Chess at Three, but I’ve also had a major hand in creating our curriculum and training other tutors specifically in self regulation using Thinking Cups. I believe control is important in the areas of behavior, thought, movement, and feeling. Control within these areas is considered self regulation. As I was researching self regulation and executive function (control in the brain), I found a very interesting blog post by child development psychologist, Ashley Soderlund. Soderlund’s blog, Nurture and Thrive, focuses on bringing research-backed, yet practical and accessible, parenting tools that can be used in real life. Soderlund’s article dives deep into the thought of self regulation and gives seven wonderful ways for parents to teach self regulation to their children. As I was going through them, I was amazed and proud to realize that Chess at Three fulfills each one of them. Below I have also listed her seven ways of teaching self regulation and highlighted how Chess at Three exhibits them in our curriculum and lessons. Help your child recognize the higher-goal. One of our high goals for a Chess at Three lesson is to have fun and learn a chess piece. How do we get children to have fun? Most children will tell you that they have fun when they win, but we focus more on smaller objectives than winning. Our mission is getting children to focus on our stories. When we gently guide them and engage them to listen, they have fun with each story. We guide them and engage them by asking them to perform Thinking Cups, where they physically keep their hands to themselves and take a stance that allows them to focus. Through the fun story they learn a fun character (chess piece). After learning the story and meeting a new character, they learn how to move the chess piece correctly – which is our high goal. Use naturally occurring situations to teach strategies for self-regulation. This naturally happens when we play games that have a lot of fun physical pieces, and chess has a lot of that. A chess board has sixteen pieces on each side of the board. That is 32 amazing things to grab, knock over, kick, throw, and move anyway they want to on the board. Not only do we use Thinking Cups during story time, but we use it during game play. A child’s urge often times is to keep their hands on the board and mess with the pieces. We ask them to utilize Thinking Cups so that they see the whole board, and no little arms or hands are in the way. Blocking the board or jumbling the pieces causes them to not make moves they are proud of, which in turn, causes them to not have fun. Thinking Cups allow them to see the whole board and apply the moves they learn from the stories. Acknowledge the challenge of regulation. A great example of this is waiting. Kids struggle with waiting. When a child struggles, Soderlund advises to acknowledge it. Our tutors do just that. This challenge shows up each time a child has to wait for their turn in a game. When a child wants to hurry and make their next move, we ask them to slow down. They must take turns so that their turn counts. While waiting, they can do a Thinking Cup. Our tutors often times acknowledge that waiting their turn is hard but the reward is worth it. This is a cornerstone of self-regulation. Have your child make a choice and a plan. Soderlund encourages parents to give children choices throughout the day so that they can start to formulate a plan. When children have opportunities, they develop decision making skills which allows them to experience mastery over their life and choices. There are opportunities on every turn in the game of chess. Getting a child to realize that is one of our main goals. Getting them to slow down and choose which piece to move allows for many opportunities to make a plan. Chess at Three has specific curriculum on how to formulate plans and how to deal with the emotions of its outcome. Self regulation is not something you can simply tell a child to do. Self regulation must be practiced. That is why Chess at Three tutors have immense patience. They go slow and have much different goals from other types of chess tutors. We do not overload the child with pressure to do what we tell them to do; we tell them a story so the child can figure out what to do on their own. Our curriculum contains mini games, where we use only some of the chess pieces at any one time so children can figure out what is the best thing to do. We also use games that we call “chessercises”. This is when we get children to play physically in the space. Pretending to dress up like chess pieces, move like chess pieces, and even playing physical awareness games like simon says or red light green light. Remember self-regulation skills develop over a lifetime. One of our main goals is to get children to fall in love with chess. We want our students to have a positive and wonderful experience, no matter their age. We don’t like the heavy pressure and expectation for really young children that other chess companies enforce. We want them to experience gratitude so that they play the game for the rest of their life. We encounter a lot of adults who are appreciative that their parents have taught them the game. We strive to reach this same goal: getting children to love and benefit from chess for the rest of their lives. Realize it is just as important to let go of control. “The human goal is to be as undercontrolled as possible and overcontrolled as necessary.” – Block and Kremen. 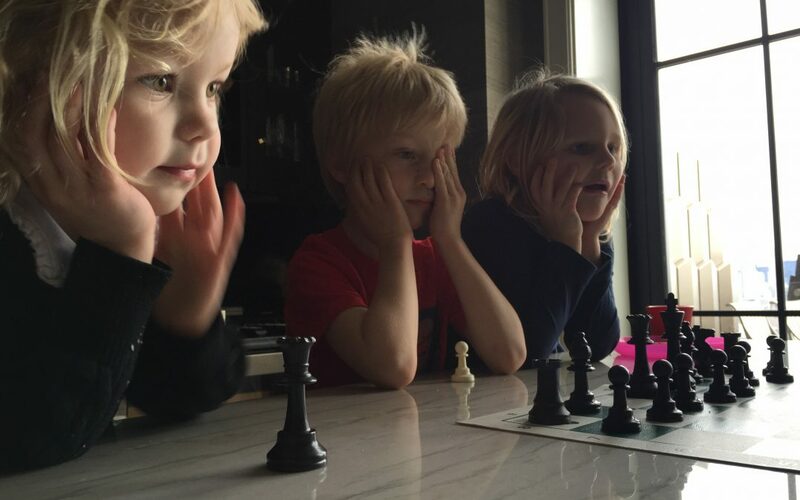 As much as we try to get a child to control themselves, we at Chess at Three love it when a child lets go! We let kids sing and be loud. We get them up to burn some energy. We let them even design their own games at a certain point. We play Crazy Chess: everything is backwards and all the rules are different. Our tutors love engaging with kids in ways that make them feel free and unabandoned to fall in love with the game. Chess at Three loves getting children to learn on their own. Self regulation is a big part of that. It helps in many immense ways, and Thinking Cups are at the heart of it.